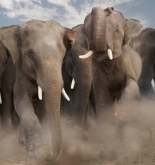 Elephant Watcher's coverage of the general election for the 2012 presidential race begins today. Though there are still a few remaining primary contests in the Republican presidential primary, Mitt Romney has already accumulated a majority of the total delegates; Romney is guaranteed the Republican nomination. Information on the Republican primary results may continue to be accessed on the Primaries page. The main pages of the website have been updated for the general election. The Campaign Status page indicates each party's nominees for president and vice president. The Candidate Profiles page contains profiles for the presidential and vice presidential nominees, as well as each ticket's strengths, weaknesses, and optimal strategies. The Candidate Rankings page now calculates Romney's and Barack Obama's odds of becoming president, based upon their winning scenarios. Finally, the Primaries page has been replaced by the Polls page, which provides the most recent national polls, along with an adjusted average. All of the pages for the Republican primary will still be available in archived form, with links provided at the top of the corresponding page. The general election has begun, but most voters will not begin to pay close attention to the race until late in the summer, when the parties hold their conventions (August 27-30 for the Republicans, September 3-6 for the Democrats). Until then, the race will be in flux, especially since Romney has not yet selected his vice presidential running mate. Nevertheless, Elephant Watcher has conducted an initial analysis of the race and has calculated that Mitt Romney's odds of winning the presidency now stand at 65%. Since there is no chance of a third party candidate winning, Obama's chance of victory is 35%. Romney's odds of winning may seem surprisingly high, given the closeness of the national election polls (even accounting for the registered vs. likely voter issue), Romney's lower odds on Intrade (to be covered in a future post), and the fact that Obama is an incumbent. However, as with the 2012 Republican primary, Elephant Watcher's calculations are not determined merely by studying the polls and conventional wisdom. Instead, likely scenarios for each candidate's victory are constructed and then compared to reality. Obama's main difficulty is that most voters (1) want a change in the direction of the economy, (2) don't think Obama is capable of providing that change, and (3) do view Romney as a viable alternative. However, the race remains fluid. Each candidate has at least one plausible path to victory, and they have not yet begun to exhaust their opportunities for employing their strategies. Each candidate's odds of winning the presidency will go up or down depending on how well they perform in the race. Elephant Watcher will periodically recalculate the odds and provide relevant updates.